Early Fall Shoe Trends: Ornaments, ruffles, and sequins, oh my! Welcome to the second installment of Shoeflyer’s exploration of fall shoe trends. Yesterday, we welcomed back booties. Today, we’re glitzin’ it up with ornaments. I, for one, couldn’t be happier that glam rock seems to have invaded the shoe world. This is another trend that will stretch past this summer. Sequins, feathers, bows, and ruffles are here to stay, at least for one more season. To get in on the glam, look for luxurious, Moulin Rouge-esque materials and eye-popping heels. We knew gladiator sandals would be hot this summer, but Hayden Panettiere is making them sizzle. The Heroes star was recently seen wearing a pair of black gladiators during a guest appearance on David Letterman’s Late Show where she was promoting her new movie, “I Love You, Beth Copper.” Her (seriously) little black dress may have contributed (slightly) to her overall appearance, but we all know it’s the shoes that complete the package. If you’re looking to perfectly compliment a little black dress of your own, Shoefly has all the answers. A New York Times article titled “Haute Couture Faces Uncertain Times” summarizes the challenges the exclusive circle of Haute Couture designers face in these days of economic difficulty. Apparently, for the lavishly rich, paying up to $30,000 for a masterpiece of a dress was more justifiable before the economy tanked. Now, designers like Christian Lacroix are filing for bankruptcy. Some designers have braved these rough economic seas by scaling back at Fashion Weeks, offering more mid-priced merchandise, and hosting Haute Couture shows in house. Still, this isn’t the first time that the fashion world has been forced to get creative in the face of economic instability. 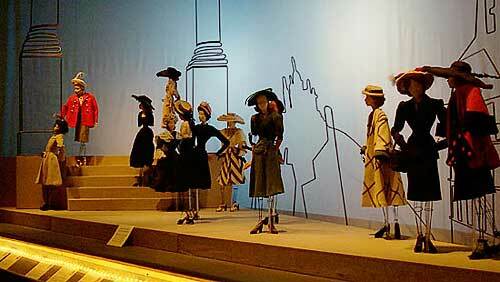 In fact, compared with the designers in Paris following WWII, today’s designers seem downright spoiled. A recent visit to an exhibit called Theatre de la Mode at the Maryhill Museum of Art in Maryhill, WA, increased my appreciation for the creativity and determination of post-war European designers. An excellent article on fashion in Baghdad has me feeling blessed to be able to express my inner diva. In their article, “What Not to Wear, Baghdad-Style: Fashion Rules Begin To Change,” Timothy Williams and Abeer Mohammed provide an excellent overview of just how much has changed in Baghdad in recent years. After the United States invaded Iraq in 2003, clerics set strict rules about how Iraqi women could dress. Women who did not wear body-covering, full-length abayas were threatened, kidnapped, or even killed by armed militia members. As one woman interviewed in the article explained, “Militias did not want women’s bodies to be visible, because they thought it might charm men.” Even women who wore full-sleeve shirts and long slacks were targeted by militia, so women across the city erased themselves into cloak-like abayas. Thankfully, as the city has stabilized in recent months, a small group of young women have been brave enough to exchange their abayas for styles of their own choosing. Mini-skirts and Mary Janes are appearing across the city. Playful, Peeping Toes? Yes, Please! The Northwest’s spring weather changes as often as an SNL cast member, alas and alack. This week, Portland’s forecast has seen hail, rain, and sun– often in the same day. With such changeable weather, I can’t very well bring out the summer sandals yet. I’ve been yearning for the full-foot-exposure days of summer, when my feet will finally have the chance to escape their (admittedly adorable) prison of fully-enclosed shoes. Is there some middle road between winter boots and summer sandals?